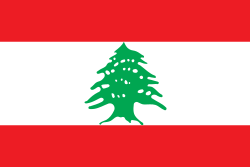 The banner o Lebanon (Arabic: علم لبنان‎) is formed o twa horizontal reid stripes envelopin a horizontal white stripe. The white stripe is tae be twa times a reid ane (ratio 1:2:1)—a Spainyie fess. The green cedar in the middle touches each o the reid stripes an its width is ane third o the width o the banner. It wis designed tae be a neutral banner, no allied tae ony ane o Lebanon's releegious groups. The reid stripes seembolise the pure bluid shed in the aim o liberation. The white stripe seembolizes peace, an the white snow coverin Lebanon's muntains. The green cedar (Arz) (Species: Cedrus libani or Lebanon Cedar) seembolizes immortality an steadiness. The Lebanese banner efter the faw o the Ottoman empire. The Lebanese banner, durin the French mandate (1918–1943). Durin the French Mandate o Lebanon, the Lebanese banner wis designed bi the preses o the Lebanese Renaissance Movement, the late Naoum Mukarzel. It wis seemilar tae the tricolour banner o Fraunce but wi a Cedar in the middle. The preses Lebanese banner wis adoptit juist prior tae unthirldom frae Fraunce in 1943. Seekin for unthirldom, the actual banner wis first drawn bi member o parliament Henri Pharaon in the Chamber o deputies Saeb Salam's hoose in Mousaitbeh bi the deputies o the Lebanese parliament. It wis adoptit on December 7, 1943, durin a meetin in the parliament, whaur the airticle 5 in the Lebanese constitution wis modified. Ane theory is that syne Henri Pharaon wis a lang-time consul in Vienna, Austrick an wis an avid friend an foonder o the "Austro-Lebanese Association o Friendship", the colors coud hae been inspired bi the reid-white-red Banner o Austrick. The Austrian banner is ane o the auldest in the warld, datin tae the 13t century when it first probably appeared efter the Siege o Acre durin the Third Crusade. ↑ "Henry Pharoun Is Slain at Home; Founder of Free Lebanon Was 92". The New York Times. 1993-08-07. Retrieved 2008-10-08. ↑ "Lubnān, Republic of Lebanon, Al-Jumhūriyyah al-Lubnāniyyah". Flags of The World. CRW. Retrieved 2009-08-08. Wikimedia Commons haes media relatit tae Flags of Lebanon. This page wis last eeditit on 24 Februar 2018, at 05:11.